A Unicef report titled ‘The Situation of Children in India : A Profile’ tells us that India is home to 20 per cent of the 0-4 years’ child population of the world, which is significantly larger than the number in China even. The number of live births in our country is estimated to be 27 million, which again constitutes 20 per cent of the total number of live births in the world. Reason enough for this to be a really important market for any business that sells products or services to babies, toddlers or kids, whether in the mass segment or premium. A comparison of the change in the population pyramids of various countries – we looked at these in this post a few weeks back – tells us that India will continue to be an attractive destination for such firms at least another 15-20 years. Though the decline in fertility levels means that the base of India’s population pyramid in 2026 will be narrower than that in 2001, it will continue to be larger than that of other countries for some time still. 22% of the total population increase in India of 371 million during 2001-26 is anticipated to occur in Uttar Pradesh alone. In fact, nearly 50% of India’s demographic growth during this period of twenty five years, is projected to take place in the seven erstwhile BIMARU states (Bihar, Chhattisgarh, Jharkhand,Madhya Pradesh, Rajasthan, Uttar Pradesh and Uttaranchal); i.e. of the projected increase in population of 371 million in India during 2001-26,187 million will occur in these seven states. 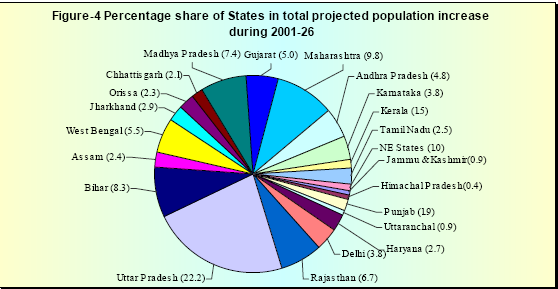 In contrast, the contribution of the four southern states, namely Andhra Pradesh, Karnataka, Kerala and Tamil Nadu, to the total increase in population size of the country during 2001-2026 is expected to be 47 million -13% of total demographic growth of the country. This raises a few points relevant to companies selling age or life-stage related products. Those selling products for babies, toddlers or kids would do well to keep in mind that a large chunk of their market in 2026 will be in the erstwhile BIMARU states. They need to plan for building a good distribution infrastructure in those regions and for generating demand after understanding those customers, their sociocultural backgrounds, lifestyles and needs etc. This will be especially critical for companies aiming at scale and large revenues. If however, they are strong in the southern states and intend to remain geographically focussed, they need to think about where growth will come from once the penetration reaches saturation level. The selected strategy could be in the domain of brand extensions / new products to existing consumer and customer segments, or targeting new consumer segments, but neither option has easy quick-fix solutions. With due apologies to those that object to the idea of education as a business, another point to ponder over is the supply (or lack therein) of good quality education at every level. This is a service that has been in short supply all over India, more so in the BIMARU states, is this changing at all ? There is some anecdotal evidence I’ve heard of the student mix in colleges in the south changing as the percentage of those from the North increased. But for those at primary and secondary level, studying outside the state (and away from parents) is not an option. What options do they have ? But this runs into the topic for the next post on the topic, which will look at some of the sociocultural implications of this demographic shift. Ask any Indian housewife for her mobile phone and check for the ‘saved’ numbers. Apart from her family (including the favourite niece in Canada) and friends (his best friend from school in Florida), work numbers (if she is a working woman),doctor ,restaurants etc., there is another irreplaceable list. One that literally makes her weep if she loses her phone. This list includes, apart from the mobile number of the household help (of course every self-respecting house help in the city has a mobile), the sabziwala (vegetable vendor), fruit wala, plumber, electrician, pan wala, dvd wala, istri wala (ironing man), dhobi(washer man), and AC/Washing machine repair wala. What is amazing is that, the other day I happened to stop by on the road to buy a jasmine plant from a redi wala (person selling things from a hand cart) selling plants, and asked him where I could find him next. Out came his mobile and he promptly asked me to save his number for future use! And while I may know the physical location of the fruit and vegetable vendors, I certainly don’t know where exactly my electrician and plumber are located. I call on their mobiles, they arrive and do the job. C’est Finit (That’s it). My kabaadi wala (collector of waste / old newspapers/ bottles) is a phone call away and do I even need to know where he recycles the stuff ? These businesses thrive on the mobile phone. Their numbers are their visiting cards and their customer referrals happen when we hand over their mobile numbers to friends and family over a meal,when someone inquires if we happen to know a decent plumber or AC repair man. Maids and drivers who are looking for jobs in an area often just give their numbers to the building watchman, who then will give them a quick ring in case there is a ‘job opportunity’ in the building. If someone is low on ‘balance’, you will most likely get a ‘missed ‘ call and then call them back. Even my mother uses the missed called method, to let the friend who accompanies her for their morning walk know that she is on her way. The system works…. curious though it may seem. There is a whole new business model in operation here and it has spawned a whole new way of expansion and growth for these small self -made mobile owning entrepreneurs, who make up an indispensable part of our world, and dare I say, the Indian economy. Who needs bricks and mortar then, when you have the Advantage Mobile!